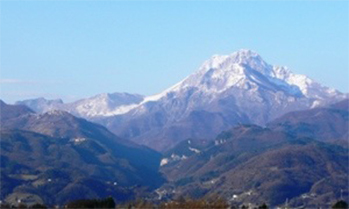 Here is an extract from "Garfagnana Trekking" which tells the story of L'Uomo Morto. My grandfather Nicola Bertozzi was born in the Commune di Molazzana, in which the L'Uomo Morto is located. First, the mountain, the top of which looks like a half circle, which we see in Pete's photo from Barga, is called the Pania Secca (1711 m). 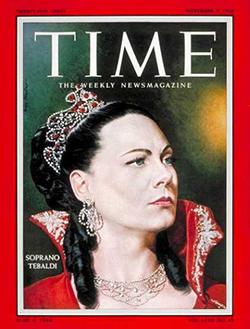 When I attended law school in New York City, I often went to performances at the Metropolitan Opera, where I would buy a standing room ticket for two dollars and often heard Renata Tebaldi sing. What a deal! She sang with all her heart, and you can't believe how much the audience loved and applauded her. On 25 Aug 1967 the Met performed Verdi's Otello in Newport, Rhode Island (my home state) with Jon Vickers (the great Canadian tenor) and Tebaldi and I had the opportunity to shake hands with both of them backstage after the performance. Tebaldi's smile would light up an entire theatre, so being face to face with her was blinding. She was a great star in the operatic firmament.